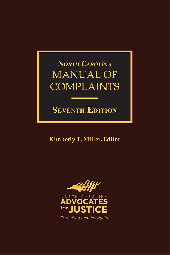 The North Carolina Manual of Complaints is a quick reference guide to a broad spectrum of complaints in the areas of Automobile Torts, Employment Law, Premises Liability, Products Liability, Medical Negligence, Consumer Areas of Practice, Nursing Home Litigation, General Negligence and Commercial Litigation. 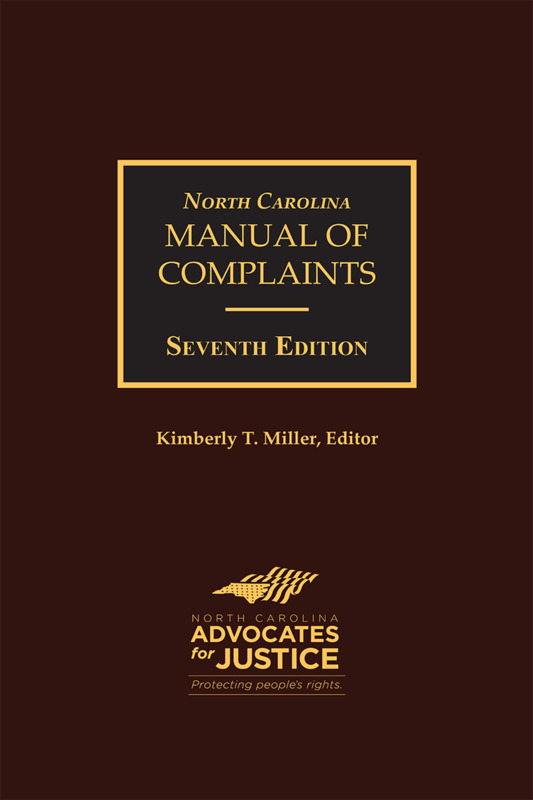 Edited by Kimberly T. Miller, a leading attorney and NC Advocates for Justice member, many of the complaints added to the Seventh Edition reflect new laws and others are tried and true examples from attorneys across North Carolina. 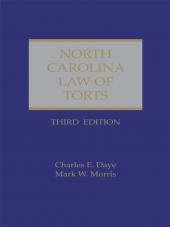 The nearly 1900 page manual contains 9 chapters with more than 100 complaints, and includes practice tips and pointers for each set of complaints. This new edition is a must-have resource for all trial lawyers in North Carolina. 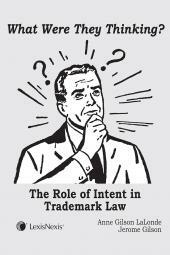 Kimberly T. Miller is a trial lawyer at the law firm of Owens & Miller in Raleigh, NC. Her practice is limited to representation of plaintiffs in the litigation of injury claims, including auto torts, commercial vehicle collisions, wrongful death, and premises liability. She has dedicated her entire career as an attorney to the exclusive representation of plaintiffs in the litigation of injury claims. Prior to forming Owens & Miller in 2011 with her law partner and fellow NCAJ member William Owens, Kimberly was a trial attorney in the Personal Injury Division of a larger statewide injury law firm based in Raleigh. In addition to litigating cases throughout the entire State, Kimberly has tried jury trials to verdict across central North Carolina, including Wake, Durham, Harnett, Johnston and Cumberland Counties. Honoree of the 2012 Women of Justice Rising Star Award given by NC Lawyers Weekly. Kimberly is a member of the Million Dollar Advocates Forum, which has membership limited to attorneys who have obtained million dollar verdicts, awards or settlements. Kimberly is active in the local Wake County Bar, NCAJ and Campbell Law, where she serves as the Chair of the Campbell Law Alumni Association Board of Directors. A life-long North Carolina resident, Kimberly is originally from Salisbury, NC and grew up in Lexington, NC where she attended Central Davidson High School with her identical twin sister. She graduated from the University of North Carolina at Chapel Hill with a bachelor’s degree in Public Policy Analysis. Kimberly obtained her law degree from Norman Adrian Wiggins School of Law at Campbell University, back when it was still in Buies Creek. Kimberly and her husband, attorney Jason Miller, live in Raleigh with their two children, Sicilia and Kesler.